Home Opinion Are our Gurdwaras Dysfunctional? The Assessment. Are our Gurdwaras Dysfunctional? The Assessment. Are our Gurdwaras dysfunctional? DR KARMINDER SINGH DHILLON explores the topic in a three-part series. In this part two, he makes an assessment. Reades are encouraged to share their views/comments which the author may incorporate into the remaining part. To argue otherwise would amount to an exercise in deception. By and large, our gold plated structures, sprawling marble-adorned complexes, modern architectural constructs and beautiful buildings (and even their humble variants) are just that – physical structures that are admirable; are able to attract occasional large passive crowds and chalk up substantial incomes in the form of donations. A vast majority of our Gurdwaras do little more than organise weekly diwans that constitute kirtan by professional ragis, akhand path readings by professional pathis, the occasional katha or sermon also by a professional and conclude with the serving of langar. Part 2: Are our Gurdwaras Dysfunctional? The Assessment. Part 3: Are our Gurdwaras Dysfunctional: The Root Causes. With few exceptions, these “professionals” are largely disconnected from the sangats they serve and thus oblivious to the spiritual challenges facing their congregations. Their primary motive is to earn a living through their “professional” activities and so long as the sangat “enjoys” their “musical presentations” and gives them sufficient bheta, they are content. A vast majority of our Gurdwaras have no primary function other than acting as a venue for the conduct of Anand Karajs, Antim Ardas and other functions where the sangat has no role other than passive and reciprocal attendance – we go because we fear that if we didn’t, then others will not come to our functions. Yet the strongest evidence that our Gurdwaras are dysfunctional is that they are steadily emptying out of Generation Y and Z Sikhs; that our youth are become increasingly alienated from our Gurdwaras; and our children are beginning to disconnect from Sikhi by the hordes. The root cause of such dysfunction lies in our wilfull neglect of the original and rightful functions of Gurdwaras, as intended by our Gurus. An assessment of each of these seven functions may be worth conducting. There is no denying that Gurdwaras do conduct Punjabi classes for children. Some conduct kirtan classes and yet others provide paath reading instruction. Yet by most standards, these classes are ad hoc, follow no proper teaching syllabus and are highly dependent on the individual instructor for their effectiveness and even continuity. Thus to conclude that a Gurdwara has become an Education Centre by stopping at such meagre activities is to deceive ourselves. To become one, a Gurdwara ought to – at the very least – run regular kindergarten classes for our toddlers, systematic Punjabi language classes for our youth and teach Sikhs of all ages to read and understand the messages of banee. As an Education Centre, Gurdwaras should provide instruction in computers, science and mathematics, music, physical exercise, career guidance, public speaking, healthy eating, speed reading and a host of other skills for its sangat on a regular and sustained basis. Doing so would make Gurdwaras an attractive and location for our youth to spend their time. Gurdwaras can further become the choice location for our professionals if we can get them involved in making our Gurdwaras Centres of Education. We are a community of talented professionals. Many of them would be most willing to donate their time and share their skills with our youth as part of their sewa. To realise such an aspiration, Gurdwaras must adopt an inclusive approach towards our professionals in particular and the sangat in general. Getting the sangat and youth involved creates buy-in, generates a feeling of ownership of the Gurdwara, and puts the process of alienation to a stop. Such involvement further transforms the sangat from passive and casual observers to active and contributing participants. Given the immense resources that Gurdwaras can muster, the inspiration provided by our third Master, Guru Amardas ji and the length of time that most of our Gurdwaras have been in existence, our Gurdwaras should be operating schools, colleges and universities; not unlike the Christian Mission schools, colleges and universities that operate all over the world. This is perhaps the one function where Gurdwaras have failed miserably. This function requires a focus on banee, creating an accurate understanding of the messages of our Gurus and inspiring their application in our daily lives. The core reason for our failing in this function is that instead of centring on banee, the spirituality of our Gurdwaras is focussed largely on rituals, social gatherings, “religious” functions, and jor-melas of various pretexts. Should one make a listing of spiritual Gurdwara activities, the top three would include unending Akhand Paaths and Sahej Paths which even the sponsoring families don’t listen to, jod-melas for a variety of purposes and an overload of banee reciting or chanting sessions which are anti-thesis to the principles of Gurmat. The two core spiritual components of Gurdwara activities – kirtan and katha – too have ended up being stripped of their proper spiritual value. Kirtan is largely done by professionals who have transformed it from spiritual to commercial (kanrus) by focussing on catchy tunes and popular melodies; and presenting it as entertainment that constitutes a show of musical skill and vocal artistry. The current trend seems to be one of singing “shabads” from outside the GGS or self-composed “verses.” Not much objections are raised by the sangats given that a large majority are Gurbani-illiterate and simply unaware of the transgressions that are being committed. Many self-proclaimed kirtan “lovers” can be heard professing their enjoyment over what in essence were kirtan transgressions. Katha has suffered a worse fate. With few exceptions, katha is no more than retelling of sakhis– a euphemism for un-authenticated, miracle based and unbelievable stories – a large majority of which are not in line with the messages of banee and are plagiarised from the texts and belief systems discarded by our Gurus. The ridiculousness and level of disbelief of some of these sakhis are enough to turn away just about any thinking listener. The combined result of the above has been that hardly any banee-based spiritual enlightenment takes place at the Gurdwara. In fact the Gurdwara has become the source of much that is anti-Gurmat: rituals, superficial spirituality, commercialised singing and rote recitation and chanting. So how would a Gurdwara become a light house of enlightenment for the spiritual seeker? For a start, Gurdwaras need to institutionalise systematic and regular Guru Granth Sahib reading classes for our sangat and youth. This must follow with regular gubani study classes wherein members of the sangat are taught the meanings of banee and the messages of our Gurus. Gurdwaras can also organise gurbani study circles where members of the sangat come together to discuss gurbani and share their knowledge and experiences. Gurdwaras need to have well equipped libraries or resource centres for this purpose. In short our Gurdwaras need to grow the sangat in banee, and provide the resources (literature etc.) to make it into a center for spiritual enlightenment. As for the Kirtan and Katha functions, Gurdwaras must take actions to eventually eliminate completely our reliance on the “professional” and “make a living out of kirtan/katha” group of people. These people are largely responsible for corrupting the two institutions of Gurdwara based spirituality namely kirtan and katha. Serious efforts must be undertaken to develop members of local sangats to undertake both functions. The top three Gurdwara activities mentioned above should be eliminated. Akhand/Sehej Paaths are no more than rituals and have brought about no enlightenment to anyone. Rote banee recitation and chanting sessions are anti –Gurmat and produce no enlightenment. Jor–Melas should be transformed from social gatherings to Sikhi learning and development opportunities. The ultimate aim of the Gurdwara should be to grow banee-enlightened congregations; and to achieve this, our focus must return to banee. This function was grounded into the institution of our Gurdwara by the fifth Master, Guru Arjun Dev ji who ran a clinic for lepers at Taran Taran. The aspiration was for the Gurdwara to provide for physical health of the sangat alongside the spiritual well-being (function two above). I have yet to come across a Gurdwara that has a designated clinic where the poor, sick and elderly can come and obtain medical care. This is despite that fact that the Sikh community has large numbers of physicians, pharmacists, nurses and dental experts – many of whom would be most willing to offer their services as sewa if approached. Given the millions that the bigger Gurdwaras have accumulated in their bank accounts, one should think that opening and running a community hospital would be a better choice of serving humanity than embarking on ego generating acts of installing domes of gold on the structure of the Gurdwara, adorning the walls with marble and building extensions. This is the one function that is perhaps become most distorted. We have slanted the concept of langgar to the meals that we ourselves partake in after the Gurdwara functions. We need to understand that feeding ourselves is but a small part of the concept of langgar. In such distortion, our Gurdwaras have relegated the concept of langgar by treating it as just another meal for all those who need to eat while attending a Gurdwara function. We further downgraded the Gurdwara kitchen to a place to churn out varieties of “dishes” in accordance with our status and positions, and the langgar hall to a “restaurant” where the affording classes sit in comfort to have these “dishes”. Some Gurdwaras even have a system of packing langgar to be taken home by those who were well fed to begin with. Others regularly waste large quantities by washing it down the drains. The key word here in the performance of this function is HUNGRY. With few exceptions, our Gurdwaras have failed to create a conducive and welcoming environment for human beings – irrespective of their creed – who have no food for themselves and their families; the homeless and shelter less; and those who will have to go hungry for another night. This was the original intent of the institution of langgar as was philosophised by Guru Nanak and institutionalised by succeeding Gurus. Guru Nanak did not ask the sadhus of sacha sauda of their religion or nationality. Rare is the Gurdwara that has in place a voluntary sewa-based activity that REACHES OUT to the hungry and the homeless. Guru Nanak did not wait for the hungry sadhus to come to him. He went out to seek them. Our Gurdwaras act welcoming ONLY to us Sikhs – none of whom are HUNGRY in any sense of the word and all of whom have access to better meals in our homes. Our Gurdwaras thus stand guilty of corrupting the concept of langgar by denying it to those it was meant for. 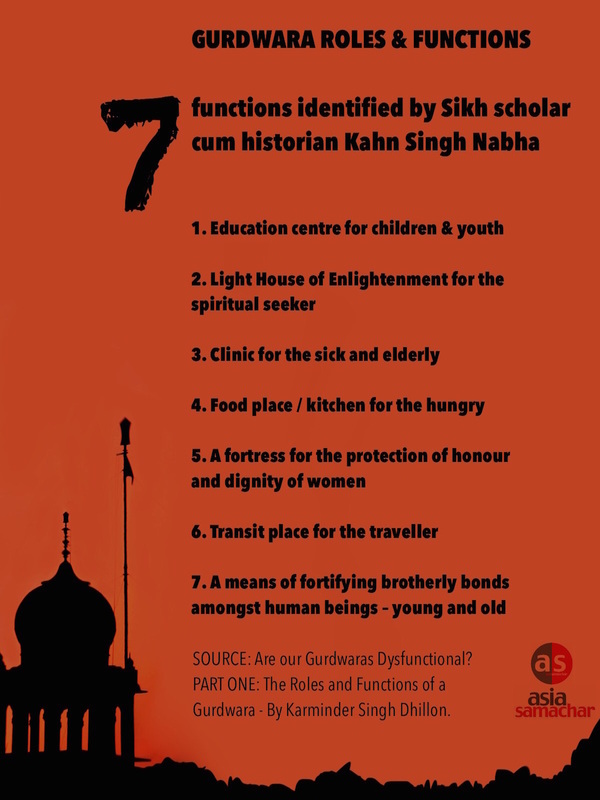 THE GURDWARA AS A FORTRESS FOR THE PROTECTION OF HONOUR AND DIGNITY OF WOMEN. This is perhaps the one function that has not been contemplated by a vast majority of our Gurdwaras. At a recent seminar on Sikhi Matters I attended, one speaker narrated a story of a woman in distress who turned up with her two children to seek refuge at a local Gurdwara. She was told to write in to the management committee for consideration! The fact that the committee was only meeting in a month’s time notwithstanding, the possibility of her not surviving the ordeal that made her seek refuge in a Gurdwara did not seem to affect the Gurdwara officials. This function is rather straight forward. If a woman (Sikh or otherwise) were to be battered by her family, or her honour and dignity in danger, or her life under threat – she should be able to walk into any of our hundreds of thousands of our modern Gurdwaras and expect to be protected, be provided shelter, or accorded social and legal support and assistance. Gurdwaras ought to have a policy on such an important matter and should set aside adequate resources for it. Gurdwaras must enlist the voluntary services of advocates and solicitors as well as family counsellors and psychologists from amongst their sangats to assist in this function. There is a need to set up funds to assist those women who may not have the financial resources to cover legal and court costs. Sikhs proudly narrate stories of their heroes who risked their lives to rescue women being taken by looters like Nadir Shah for sale as slaves in Kabul and Kandhar and returned them to their families. For those families who refused to accept these women, the Khalsa took them into its fold, calling upon eligible Sikh men to marry and protect their honour. Its ironical, therefore, that Sikhs Gurdwaras are unaware that this is a primary function of the institution. Should Gurdwaras wake up from their wilful neglect and act as FORTRESSES (Bhai Khan Singh Nabha’s word) to protect women who are in need of help, the women who come knocking would not be ones who are being abducted for slavery in Kabul, but most likely Sikh women. This is because Sikh communities are fast becoming ones with the highest incidences of domestic violence, soaring divorce rates and crippling family disputes. Gurdwaras need to set aside adequate resources in the form of rooms, washrooms etc. because such is a service to humanity and thus the function of a Gurdwara. Such a function can also serve the needs of Guru-loving Sikhs who prefer to stay in a Gurdwara during their outstation trips so that they may be able to enjoy the evening or early morning kirtan sessions or even partake in some sewa. As stated above, Gurdwaras do succeed in drawing substantial crowds even if occasionally. Yet a large portion of these crowds are in passive and reciprocal attendance – attending Gurdwara functions out of fear that if they didn’t, then no one will attend theirs. There is no denying that polite socialising does take place. The key words, however, are “fortifying brotherly bonds” and “amongst the young and old”. Such an objective requires active intervention by the Gurdwara on three counts. First there can be no forming of bonds of any kind if the young do not come to Gurdwara in the first place. The reality of modern day Gurdwaras is that the youth are staying away. It is thus incumbent upon the Gurdwara to create specialised activities for this group of Sikhs. For this purpose then, our Gurdwaras must set up and EMPOWER youth wings. Gurdwaras must ensure that youth are adequately represented in the management of our Gurdwaras. We need to know what our youth want from and within a Gurdwara and empower them to put it into action. Second, meaningfull bonds can only form if the young and old actively engage in a host of activities jointly either in the Gurdwara or outside that are organised by the Gurdwara. For this purpose then, Gurdwaras must strive to organise interactive activities. Gurdwaras must ensure that our youth have a say in such activities. Third, Gurdwaras must appreciate that there is a specific purpose in our Gurus wanting this function to be performed at a Gurdwara and between the young and the old. Such fortification of bonds would allow the older generation to pass on their spiritual and sewa based experiences as well as knowledge to the younger generation. It would also allow for the younger generation to carry on this noble practise when their turn comes. Gurdwaras must thus ensure that adequate activities are geared towards such fortification. Gurdwaras further need to ensure that our granthis, ragis, parcharaks and kathakars speak the language of our youth, and can relate to the issues and lives of our youngsters. TYING IN THE NISHAN SAHIB TO THE ASSESMENT OF ROLES AND FUNCTIONS OF THE GURDWARA. The Nishan Sahib is, for all intents and purposes, a sign board that stands tall and calls out for those who need spiritual guidance, protection, solace, education and want to fortify their bonds with humanity. It is located high as a beacon of hope for any woman seeking to protect her honour, as a light house for a weary traveller seeking a place to rest, and as a welcome sign for a hungry/displaced/homeless person seeking a meal. The Nishan Sahib is thus inviting them, in the name of the Guru, to come to the Gurdwara and be served. The assessment being as argued above, the conclusion is that our Gurdwaras have failed to deliver what our “sign board” proclaims and broadcasts. We are thus morally and spiritually guilty of putting up a sign promising the seven functions above but have not strived to provide them. The dysfunctionality of our Gurdwaras is thus in the name of the Guru and betrayal of the Gurus aspirations for us Sikhs to be of service of humanity. NEXT, PART THREE: Are our Gurdwaras Dysfunctional? The Root Causes. Part TWO: Are our Gurdwaras Dysfunctional? The Assessment. Gurdwara Parbhandhaks, power crazy leaders of Sikh organizations, make-a-living professional ragis, granthis, pathees and others who have brought our Gurdwaras to such such levels of depravity – shame on you ! A very good and well explained thoughts based on today’s reality on the functions of Gurdwaras especially in Malaysia . Time to reflect and rethink the roles and practical functions of our Gurdwaras. Well done Dr Karminder Singh for the enlightenment and hope you would share more of your thoughts and opinions and a big thank you to Asia Samachar for publishing all such meaningful articles.